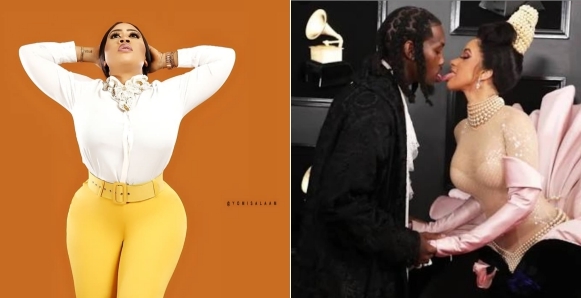 Nollywood actress, Moyo Lawal reacted to the picture of Cardi B and Offset tongue-licking each other at the grammy awards show. Recall that the couples marriage crashed after it leaked that Offset was having extramarital affairs. According to the actress, the picture shows clearly why she doesn’t interfere when couples are having issues. “This is why …. …… ….. I avoid getting involved in couples wahala at all costs …. The *two both of them* usually know why they are together. So whether , he is sleeping around , she is sleeping around ••• He is beating her, She is beating him ••• She is emotionally abusing him or the other way round••• She is paying all the bills 😴😴😴 … It is nobody’s business yooo ••• ……. ……. …. ….